Park is an amazing, blessed place that preserves and protects the natural beauty of St John. 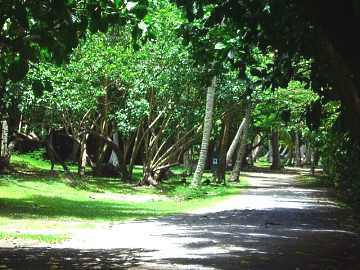 Nearly two-thirds of the island, and much of the surrounding sea, is protected by the park. verdant than it was 50 or 75 years ago. The park offers you a wide choice of unique attractions that you won't find anywhere else. To start, there are plenty of beautiful beaches for you to explore. This is where you can enjoy some of the best snorkeling to be had anywhere. You can explore pristine coral reefs virtually unaffected by development. You'll find more than 20 hiking trails covering miles of gorgeous terrain. There are trails that take you along picture-perfect shorelines, and others that lead you to fascinating 18th century sugar plantation ruins. You can also hike trails that wind up the lush, unspoiled mountainsides to spots where you'll enjoy breathtaking panoramic views. There's also an abundance of wildlife. You can see over thirty species of native birds, numerous reptiles and amphibians, and several species of introduced animals (bats are the only mammals native to the Virgin Islands). You can enjoy a variety of programs offered by the park's rangers, including lectures, video presentations and slideshows, historic and cultural demonstrations, and guided hikes. 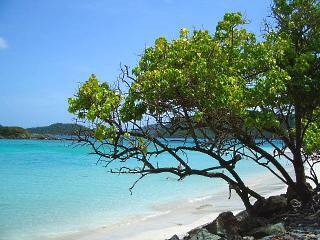 The park is also home to Cinnamon Bay Campground, the most famous campground in the Caribbean. In 1939, a study by the National Park Service recommended the creation of a park on St John. However, the outbreak of World War II caused the idea to be shelved for a number of years. After the war, megamillionaire Laurence Rockefeller spent some six years cruising the Caribbean. He declared St John to be "the most beautiful island in the Caribbean" with "the most superb beaches and views" he had ever seen. He acted quickly to buy up nearly half of the island in the early 1950s. 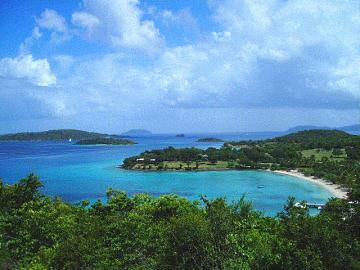 He then established the exclusive resort of Caneel Bay on the grounds of an old Danish sugar plantation. When Rockefeller became aware of the Park Service study, he transferred ownership of his St John property to his nonprofit Jackson Hole Preserve Corporation, which then offered to donate 5,000 acres to the National Park Service. On August 2nd, 1956, President Eisenhower signed legislation which converted 9485 acres on St John to National Park land. In 1962 an additional 5650 acres of the surrounding sea with its pristine coral reefs was added to the park. 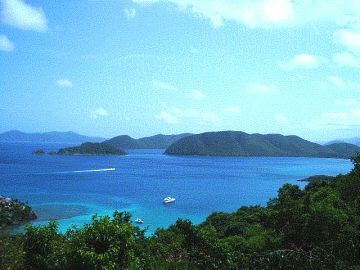 In 1978 Hassel Island in St Thomas harbor was also added to the park. Over the years, the park has become more and more popular, now receiving over a million visitors annually, making it the single most popular attraction in the Virgin Islands. Virgin Islands National Park headquarters is a great place for you to start your exploration of the park. You'll find the park's headquarters in a large two story building just up the beach from the Cruz Bay ferry dock and across the street from the Mongoose Junction shopping arcade. The visitors center here will provide you with excellent maps, trail guides, brochures and books. You can also watch a video about the park and get an up-to-date schedule of lectures, demonstrations, guided hikes, and evening programs available at the campgrounds. Visitors center hours are 8:30 AM to 4:30 PM daily.